Gather around the Christmas tree with our Holiday Village Tree corporate holiday ecards. A simple yet dramatic design that brings together real beauty with a truly festive feel. Holiday Village Tree is one of those electronic Christmas cards for business that isn’t afraid to offer something simple yet elegant. There is a real sense of understated charm around this card and that is something that we feel will ensure that Holiday Village Tree is one of our most popular choices. 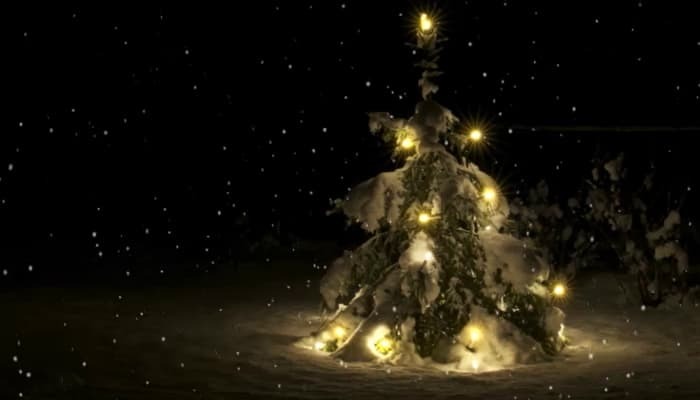 Despite the simplistic design, there is a real feeling of festivity with these ecards, featuring a lone Christmas tree sat on a snowy patch and illuminated against the night sky. It is this stark colour contrast and design that makes us love these ecards.As well as being a great choice if you are looking for the perfect corporate ecards; Holiday Village Tree is, much like the rest of our great range, classily animated ecards that can also be customised to match your requirements. Include as much or as little text as you like over the front and inner pages and even incorporate your own business logo in too, creating something truly remarkable and utterly marketable. So why not wish your clients a stylish Christmas with these fantastic electronic greeting cards?